Having looked at all the changes that Magento has brought to its Magento 2.0 platform and how those changes can impact you if you are convinced that you want to migrate from your existing Magento eCommerce store to Magento 2.0. I will not be surprised if your answer is probably not. Is migrating to 2.0 NOW right for my business? If not NOW then when should I migrate? What does it mean for me to migrate to Magento 2.0 (in terms of effort, cost, downtime, processes, customers and more)? When I decide to migrate, what should my migration strategy be (who to engage, checklist, things to take care of post-migration, and more)? In the Magento 2 migration overview document, Magento talks of four key components for migrating from Magento 1.x to Magento 2.0. Let us look at each of these components in a little more detail; because therein lies the thread that will provide answers to a few questions raised above. In Magento 2.0, the underlying architecture of how information is stored in Magento has changed. You can no longer take the data in your old Magento instance and deploy the new Magento version on top of it. To help partners and merchants efficiently transfer the key product, customer, and order data, store configurations, promotions and more to Magento 2.0, Magento has developed and launched the Magento 2 data migration tool. Magento talks about several new changes they have made to help merchants create innovative shopping experiences; starting from the way the themes are built, to the way they are deployed and configured. To take advantage of these merchants will have to make changes to their theme – they will not be able to take their existing theme and port it to the new architecture. Magento is working actively with the partner and developer community to help ensure the most widely used extensions are updated, vetted, and available to support Magento 2.0 as soon as possible. Current Magento CE or EE version – If you are on one of the old Magento CE or EE versions then you migration to Magento 2.0 must be planned accordingly. # of Products, Customers, Orders & Categories – This and the format in which your data is stored, will directly impact the time it will take to migrate the data from your existing store to the new store. List of Extensions Installed – revisit your extension list and evaluate which of these extensions you really need. Bucket your extensions into logical groupings like must have extensions, good to have extensions and not required extensions. 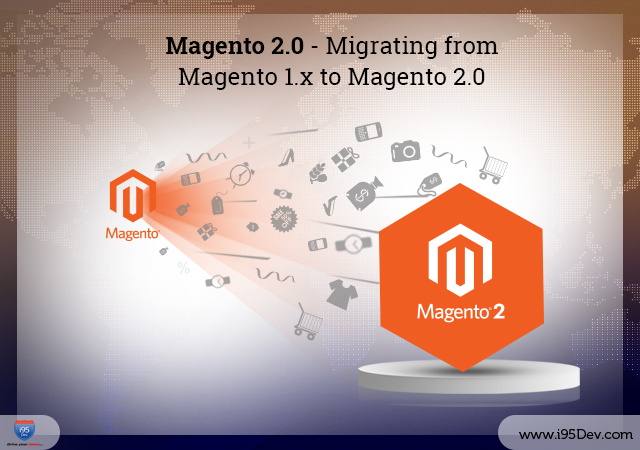 Identifying this will help you better plan Magento 2.0 migration – understand when the critical extensions will be Magento 2.0 ready and how do you migrate the data related to it. This will also help you improve the performance of your eCommerce store by getting rid of all those unused extensions, expired extensions and not required extensions. Customizations & Core Hacks – Because of all the changes in Magento 2.0, as mentioned earlier, this will be the most important and critical aspect of migration. Depending on the complexity, merchants will have to work with partners to re-implement their requirements. Do You Have the Right Infrastructure – A number of changes made in Magento 2.0 were towards improving Magento 2.0’s performance and scalability. It is important to evaluate if your current server is configured properly and how does your new store perform. Support – Identify if you have the required support, internal and external, technical and functional, to help you identify the migration complexity and effort, migrating your existing store to Magento 2.0 and maintaining the new store. Considering all the parameters involve we suggest you to work with a Magento partner who can not only help you meet all the migration challenges but can also train and support you on a need basis. The answer to this lies in your findings for the important things mentioned above; more importantly on the list of extensions installed, customizations and core hacks. For example, if you have an extension installed that is important for your business, but the Magento 2.0 support is not yet available for it then you have two options 1) find an alternate extension which is Magento 2.0 compatible or 2) Wait for the compatible version of the extension. In the case of scenario 2, when you migrate to Magento 2.0 is dependent on an external factor beyond your control. Magento is working actively with the development community to ensure the most widely used extensions are updated, vetted and available as soon as possible. We recommend businesses to wait for a few months to give enough time to the community to get up to speed with Magento 2.0 extensions and developer knowledge. During this time, you will also get to see off any patches and upgrades that Magento will release based on feedback from internal development, partners, and those early adopters. Moreover, Magento has made it absolutely clear that they will continue to support 1.x version of the platform with security patches for at least 3 years. Note: Consider migrating to Magento 2.0 not only as an opportunity to move to a more advanced, scalable and fast platform but also an opportunity to clean up; get rid of all the dead and unused data, extensions, customizations, and more. Use the time between now and the time when you decide to migrate to identify the most important data and functionality that you require in your store. This will not only speed the migration process but also add to the performance of your store.